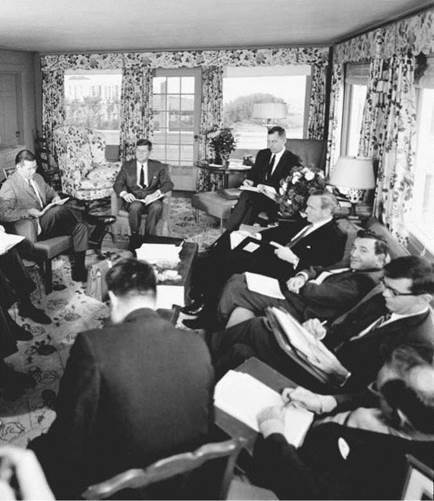 President Kennedy meeting with his senior advisers for a late 1961 budget review at his father’s house in Hyannis Port, Massachusetts. From left to right: Secretary of Defense Robert McNamara, the president, budget director David Bell, deputy secretary of defense Roswell Gilpatric, science adviser Jerome Wiesner, special counsel Theodore Sorensen, and national security adviser McGeorge Bundy (JFK Library photograph). effort to Project Mercury, the Space Task Group, which was managing Mercury, needed to be moved from its location at the Langley Research Center in Hampton, Virginia. This move was necessary because human space flight required engineering development, flight operations, and especially project management skills, not the engineering research-oriented approach that was characteristic of Langley. In late April 1961, as it was becoming clear that President Kennedy was likely to approve a major acceleration of the NASA human space flight program, NASA administrator Webb recognized that a separate, new NASA center would indeed be needed to manage the effort, and instructed his staff to begin the site selection process. He put $60 million in the NASA budget estimates being prepared for the White House as a down payment on constructing the new center. The site selection team considered locations in Florida and California, but was also well aware of Representative Thomas’s long-standing interest in having a new NASA installation in Houston. Thus NASA representatives visited Houston on May 16, even before the presi­dent’s announcement of the lunar landing goal. They were met there by George Brown of the Houston-based Brown & Root construction company, a Lyndon Johnson ally who had been consulted by the vice president dur­ing Johnson’s recent space review, and by a representative of the Houston Chamber of Commerce.13 But this turned out to be a false start in the site selection process; it was not restarted in earnest until August 7, when the Congress passed the appropriations bill that included the $60 million in funding for the new center. The opportunities presented by the decision to develop a new NASA center of course did not go unnoticed in other parts of the country, and both the White House and NASA were bombarded after the president’s May 25 speech by communications from members of Congress and state and local officials suggesting that the area they represented would be an ideal location for the new installation. Pressing the case for California was Representative George Miller, who was the acting chairman of the House Committee on Science and Astronautics after Overton Brooks fell ill. Missouri directed its advocacy through powerful Senator Stuart Symington. Making the case for Texas in addition to Thomas were Representative Olin “Tiger” Teague, chairman of the House Subcommittee on Manned Space Flight, and Representative Joe Kilgore; in addition, Speaker of the House Sam Rayburn and Vice President Lyndon Johnson advocated the Texas cause. Johnson and Albert Thomas were not political allies within the fractious Texas Democratic Party, but they were united on this issue. Of particular political concern to President Kennedy and his top political assistant Kenneth O’Donnell was continuing pressure from the governor of Massachusetts, John Volpe, to locate the new center at Hingham Air Force Base near Boston. Volpe wrote Kennedy on July 19, before the site selection process had formally begun, saying that “as one Bay Stater to another,” he wanted to call the advantages of the Massachusetts location to the president’s attention. By this time, NASA had made public its preliminary criteria for deciding on the location for the new center, and Volpe outlined the ways in which the Hingham location met those criteria, conveniently omitting the requirement set by NASA for “a mild climate permitting year-round, ice-free, water transportation; and permitting out-of-door work for most of the year.” Volpe closed his letter by saying to Kennedy, “may I urge your help in bringing this project to Massachusetts.”16 In the succeeding two months, O’Donnell and NASA’s Webb had a series of interactions reflecting Volpe’s hope that Boston would be chosen as the location for the new center. The final criteria for site selection, including both eight “essential crite­ria” and four “desirable criteria,” were approved by top NASA managers in mid-August. Before that approval, conscious of the Massachusetts interest, Administrator Webb had reviewed and specifically reiterated the “mild cli­mate” requirement as being essential. In a September 14 memorandum to the president discussing the site selection process, Webb provided five justi­fications for the climate requirement, concluding that “selection of a site in an area meeting the stated climate criterion will minimize both the cost and the time required for this project” and noting the many ways in which the Boston area failed to meet the requirement. Upon an initial assessment by the NASA site selection team, nine potential sites, notably not including Houston, met all or most criteria, and arrange­ments were made by the team to visit those areas. While visiting the original nine locations, an additional fourteen sites were brought to the attention of the team; the Rice University site favored by Representative Thomas was one of those additions to the list. In all, the site selection team visited twenty- three potential sites; they were located in Florida (2), Louisiana (3), Texas (9), Missouri (4), and California (5). At each site, the routine was similar: an afternoon arrival and greeting by state and local dignitaries, a meeting to explain the selection criteria, a breakfast meeting with local representatives, and a visit to the proposed site and a nearby college or university. The site selection team “felt that locations north of the freezing line were unlikely to meet the requirements” and thus did not originally plan to visit any such site. Delegations representing sites in Virginia and Rhode Island not being considered by the selection team pleaded their case in presentations directly to NASA’s James Webb and Hugh Dryden. Also, on September 1, a Massachusetts delegation headed by Governor Volpe and Senator Benjamin Smith, John Kennedy’s former college roommate who had been appointed in December 1960 to fill JFK’s Senate seat, met with the two NASA leaders to argue for consideration of the Hingham site and to ask that the site selec­tion team at least visit Massachusetts. A large meeting of Boston business interests sponsored by the leading local newspaper, The Boston Globe, also called upon the president to select the Massachusetts site. On September 8, Governor Volpe called James Webb, again asking whether the team would visit Massachusetts. The phone conversation was described by Webb’s biog­rapher as “acrimonious.”17 Volpe told Webb that “great political pressure was building up” for such a visit. Webb responded that “it was most difficult to promise this without doing so in many other cases,” but told Volpe that he could make public his intervention with Webb in order to relieve some of the political pressure on the governor. Webb told President Kennedy in a somewhat self-congratulatory way that he believed that “it was an eminently fair proposal for me to have put to him.” Then, on September 13, without notifying Volpe or any other Massachusetts official, the site selection team did visit the Hingham site “for an inspection of the terrain and existing buildings.” The only other site visited on the basis of political intervention was in St. Louis, to satisfy Senator Symington’s request. O’Donnell remembered President Kennedy as saying, after reading Webb’s two September 14 memos, “It’s a good decision. Let’s go through with it.” The public announcement of the selection of the Houston location came on September 19. With that announcement and the choice of sites in Florida, Louisiana, and Mississippi for launch-related facilities, the arc of new NASA installations along the Gulf of Mexico coast in the southeastern region of the United States that James Webb had advocated in his May 23 memorandum to Vice President Johnson had come into being.